eESI Podcast: Benefits Renewal Season is the Perfect Opportunity for Your Business to Offer More Options to Employees - eEmployers Solutions, Inc.
October has arrived and you know what that means. It’s that time of year again: benefits renewal season. But don’t be frightened. With a little help, you can offer your employees a selection of affordable benefits at great rates. No, it’s not a trick. Access to Fortune 500-level benefits packages is just one of the treats in store for small to medium businesses that partner with eESI. 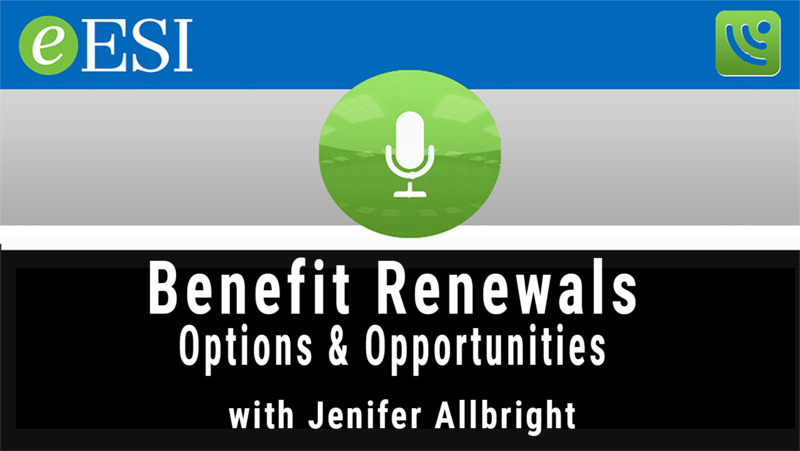 In this episode of the eESI podcast series, Benefit Renewals: Options and Opportunities with eESI Director of Broker Services, Jenifer Allbright, we talk about how teaming up with a company like eESI can help you treat your employees right this benefits renewal season – saving time, resources and money. Of course, making sure you have the right mix of health and other benefits is always important for your business. But in today’s job market, offering an attractive blend of benefits, including voluntary benefits is essential. The benefits offered by an organization have a significant impact on job seekers’ decision making writes Kerry Jones in her article, The Most Desirable Employee Benefits. What tops employees’ wish list according to the Fractl survey cited by Jones? Better health, dental, and vision insurance. Tracking employee wants in its 2018 Employee Benefit Trends Study, MetLife notes that employees want flexibility and choice when it comes to the benefits that companies offer. The current workforce includes participants from four generations. And each is comprised of individuals who have different wants and needs when it comes to benefits. How can a small employer afford to offer different benefits packages for different employees? As Jenifer Allbright explains in our podcast, employers of any size can access big benefits by partnering with eESI and taking advantage of its market power. But that’s not the only reason to partner with eESI. Allbright adds that letting the experts handle benefits administration and compliance tasks frees up business owners’ time to focus on growing their businesses. Complying with the rules of the Affordable Care Act, ensuring that COBRA transfers are handled correctly, and taking care of reporting obligations are all part of the package when a business partners with eESI. Every business is unique and so are its employees’ needs. But finding the right combination of benefits on your own can be hard. If you’d like to learn more about how eESI can help, just give us a call. In the meantime, download eESI’s free guide on Voluntary Benefits and discover how you can offer your employees even more choices this benefits renewal season.